Do Constructions Workers Climb Like Spider-Man? Terracon experts make presentations to a variety of audiences every day. But Peter Adams, a steel inspector from the Des Moines office, might be the only one who has ever had to field a question about superheroes in the construction industry. “Do you climb steel like Spider-Man?” His audience members want to know. His audience is comprised of underprivileged or at-risk preschoolers -“ some with special needs -“ and Peter gets to enjoy answering questions like these as part of his annual visit to Des Moines Public Schools’ Head Start program. For the past 12 years, he has been visiting this Head Start class, which wife, Natalie Adams, teaches. 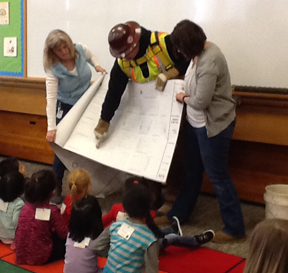 His visit is a favorite part of a unit on the construction industry that is part of the curriculum every year. Peter always has fun talking to these young children and hearing what they have to say, but there is a serious side to this as well. During his talks, Peter touches on many important topics. He teaches them that being safe is an important part of a construction worker’s job, and that to be a construction worker, you must learn how to read, measure, do math, and follow rules to make sure that buildings are constructed well. “A lot of these children don’t get the opportunity to see things like this first hand, so it’s important to bring visitors into the classroom to inspire them,” said Peter. He has a well-planned visit that involves passing around items like concrete, steel, certain tools and safety gear, rebar that is shaped like letters, and by having them try to lift a concrete cylinder with rebar inside. This usually gets them to ask questions.